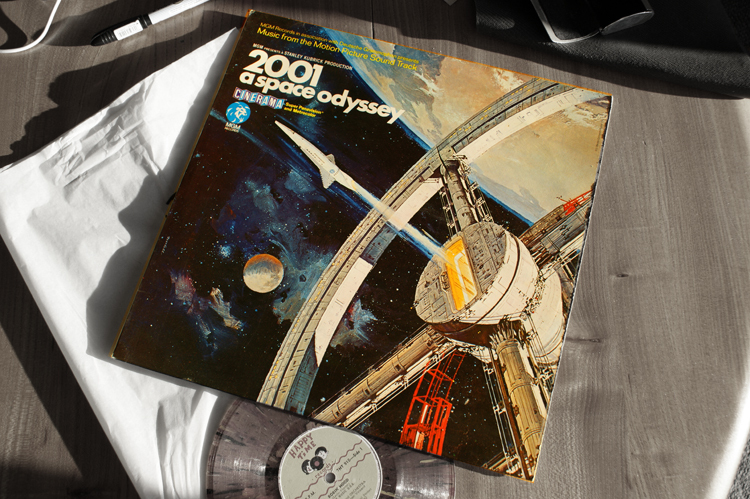 I was lucky enough to see Kubrick’s film of 2001 on release in 1968. At 14 it was a mind-blowing experience, especially on the big screen of a proper cinema (it was also issued in Cinerama, though my only memory of this form of projection was an open air screen with trestle seating set up for a few months on an old bombed out site in the city). 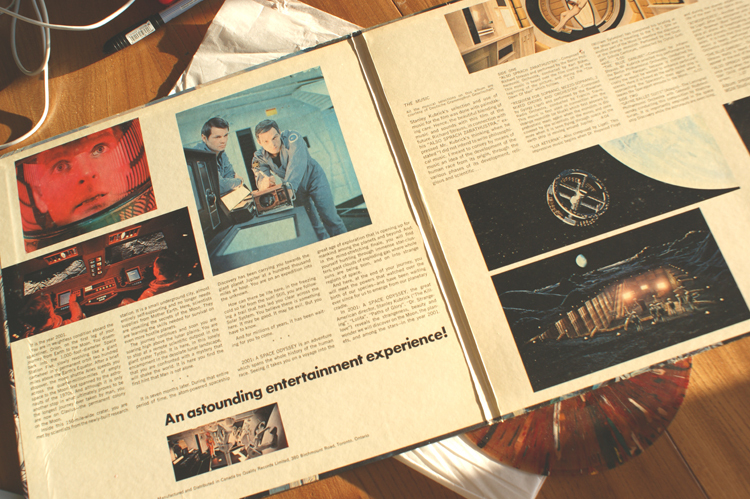 There was no rushing out and buying the DVD back then; the best I could do was pick up the MGM soundtrack album (and I think I had the Airfix kit of the Pan Am space jet which adorned the record sleeve too – wish I still did). The music was all classical, and sourced from Deutche Grammophon recordings. It’s not that classical music was necessarily square, just a tad intimidating to buy, so this bridged the gap nicely. It was a glossy laminated single sleeve and it is only fairly recently that I picked up a smart gatefold edition, issued in Canada (and I assume also in North America). It isn’t laminated but had been well looked after. 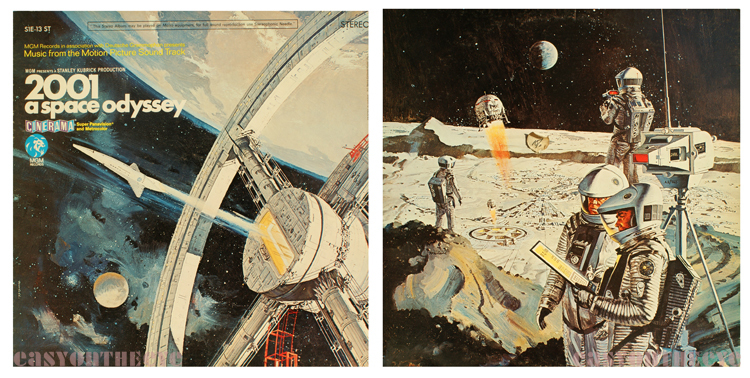 The inner gatefold has the notes off the UK sleeve, but also a nice selection of colour stills from the movie. 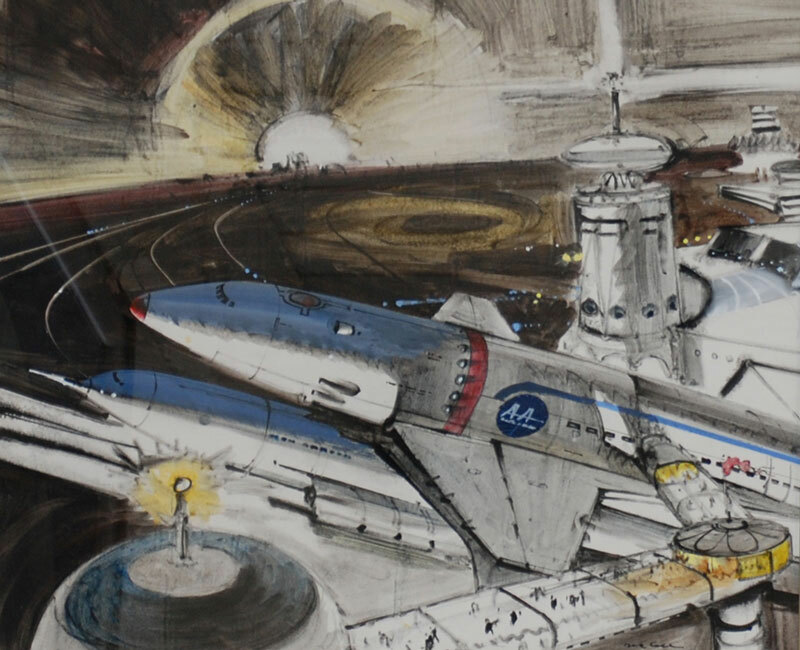 The sleeve art was based on the inspirational film poster image painted by Robert McCall, apparently at Kubrick’s request (McCall later went to London to work on further aspects of the visual preplanning for the film – Kubrick famously refused to fly). McCall was also commissioned by NASA to bring to life their various space projects, and later did some of the designs for the Apollo mission badges. Curiously the UK and Canadian sleeve use different portions of the painting, there is a difference of around 2cms in the way the image is cropped. It may be that the UK cover was taken off the original cover art film work, and cropped to lose the rather ugly and unnecessary text about stereo compatibility which runs across the top. The Canadian sleeve certainly carries a lot more detail of the painting than does the UK one. The back cover of the Canadian pressing carries another of McCall’s paintings, astonishingly showing one spaceman holding what looks suspiciously like an iPad! This painting was also used on some variant posters for the movie. 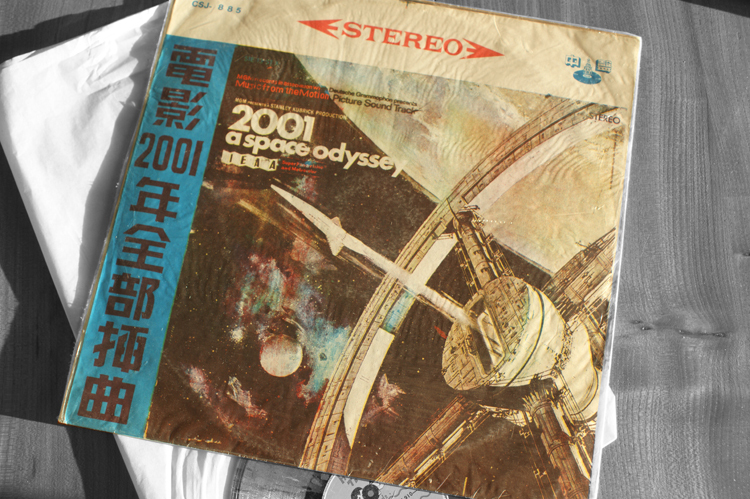 I have one other LP variant, one of those crude Korean pirate editions from the 70s. I love these for the primitive colours and printing techniques. The poorly copied cover art has additional Korean text up the side (and printers registration mark at the top), with the printed front and back sealed inside plastic which forms the pocket for the album. Inside you can see they have printed another sleeve on the back of the 2001 cover, I assume they just reversed it as necessary. Sadly McCall died in 2010 but his website does have a lot of information, and if you have a deep pocket, some stunning artwork for sale (much of his art was donated to public galleries).